In case you were trying to avoid it at the 2011 Cleveland International Film Festival, KINYARWANDA sounds like the sort of movie one is expected to take like medicine; not palatable, but "good for you", so be brave and swallow. Or, when nobody's watching, sneak out of line to something like PROMETHEUS in the next auditorium. Your pretentious act-like-they-care-about-human-rights-only-because-it's-a-good-career-move University Circle friends won't notice. Indeed, they'll probably go to PROMETHEUS before you. 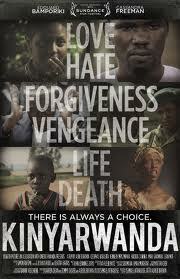 Now that KINYARWANDA is available on home video I do recommend you check it out. Most of the time these super-kitsch days, when our big-budget cinematic artists take on the topic of genocide, it's usually involving meanie alien space invaders. Yeah, ripped from the headlines, sure. But KINYARWANDA - like its big-brother relation, HOTEL RWANDA, starring Don Cheadle, dramatizes the genocidal Rwandan civil war of the 1990s. KINYARWANDA, an auspicious first feature for director Alrick Brown, filmed on location in Africa with cooperation of Rwandan citizens and authorities, and it succeeds on most sublime, quietly devastating terms. The script, using true stories from the conflict, renders the narrative as a short-subject anthology with recurring characters (a la SHORT CUTS or CRASH). As an unseen pirate-radio hatemonger (amazing he doesn't bring up Obama's birth certificate) directs the attentive Hutu militias where to strike next, a Tutsi girl sneaks out to attend a forbidden party. When she comes home, her parents have been slain. A guileless Hutu child on an errand acts as a guide for the death squads when he misunderstands their talk of guns and "cockroaches" and what they are hunting. A fearful Tutsi priest, who tried to score some goodwill with the Hutus by betraying a wanted Imam, is among the Christians saved from execution by the courageous intervention of both a village "witch" and the clergy of the Kigali Muslim community. Seeing a group of Muslims putting into action an ethical What Would Muhammed Do? reminds one of how rarely this is dramatized in the western media. Finally, survivors on both sides must come to terms with what has happened. The intimacy of Brown's direction more than compensates for the absence of Hollywood-blockbuster spectacle or recognizable stars (occasionally the digital-video cinematography does degrade into low-lighting pixel jaggies). The Rwandan genocide is not something in which I am terribly well educated at the present, so I can't fact-check the assertion, a brief allusion in the script, that this nightmare started with the Belgian colonists. Guess they sewed the seeds of clan bitterness by arbitrarily elevating the status of the Tutsi during their African-imperial days, based on pseudoscientific racial profiling of height, noses and other physical features. The accusation sounds suspiciously blame-whitey to me...but then again it's just the sort of thing Western Civilization would do. Eastern Civilization too, for that matter.